This is a hard post to write. It's just been one of those days where nothing goes well. We had some problems yesterday but we were pretty optimistic we would be able to fix them without too much trouble. Things didn't get better today. From bad crimps to breaking a handle on the robot to diagnosing a drive train problem for 40 minutes only to realize it was a dead battery, nothing went our way today. We would try to improve things only to make them worse. The current state of just about every subsystem is markedly worse then it was 36 hours ago. The biggest problem of the night came at around midnight when we were testing our latest change to the collection system and getting ready to test driver centric control. We were driving along fine, we strafed right and then when we went to strafe back left we saw the robot sort of dip and then just completely stop moving. We strafed back and it sort of worked but in a big arc. We thought we might have unplugged a speed controller or gotten something jammed in a gear. 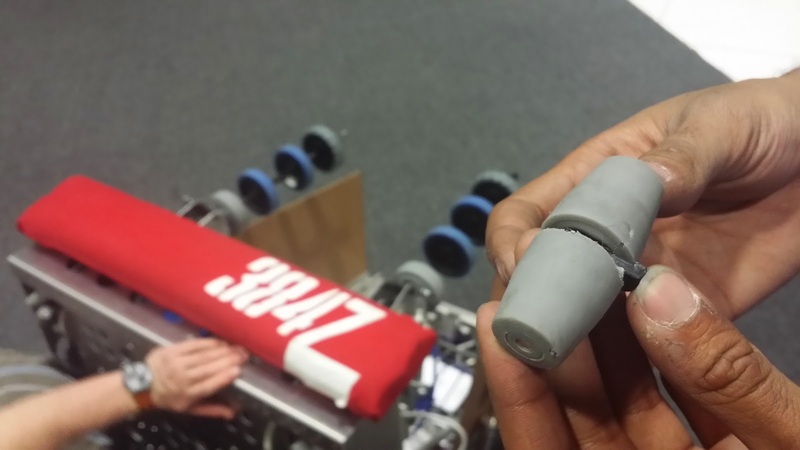 When we turned the robot on it's back to see the drive train we discovered that we had broken one of the rollers clean off our VEXpro 4" mecanum wheel. 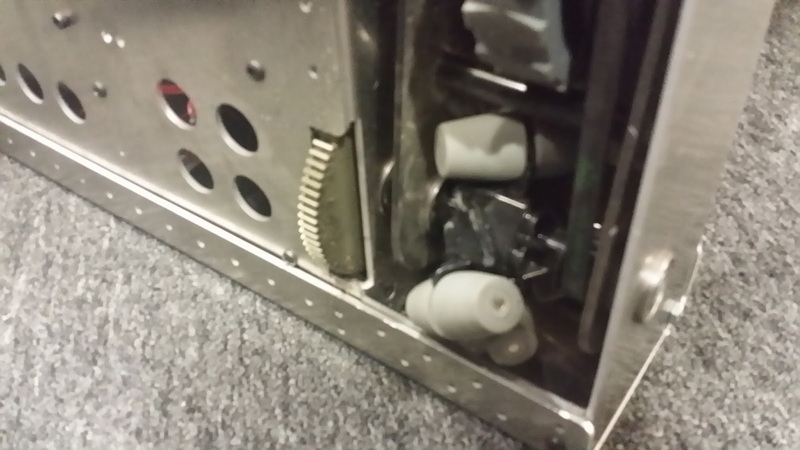 We haven't done much to these wheels at all, we have only had them for 6 days and have driven less then an hour and half on them on FRC carpet only. They haven't been put up against other robots or had any pushing tests done with them, we have just driven around and tested collection for the most part. After looking at the broken wheel we found that the roller didn't spin at all, we checked all the other wheels and have found at least five other rollers that either don't spin or are very tight. The six of us that were still at the shop at midnight discussed it and unless there is some very strong reasoning by the rest of the team to stay with mecanums, we will be switching to butterfly for this year's drive train. If this were to happen during a match we wouldn't be nearly as effective and the ability to strafe isn't worth the risk or breaking wheels and having to make repairs. To top off the day of everything going wrong, on our way down from the third floor where our practice area is to our lab we ended up on the first floor. Our lab is on the 2nd floor, literally nothing went right today. Tomorrow we'll change the wheels back to omniwheels, and we'll halt development on holonomic control and sensors. This may turn out to be a good thing, without worrying about mecanum wheels and holonomic control we'll have more time to focus on other systems. That's at least how we're going to spin it. 15 days left to get it right, tomorrow should be better since we get to watch the Superbowl as a team and have some fun.